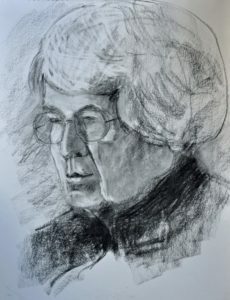 We had the first of a series of portrait sketching sessions last Tuesday. This year, we are in the Larcum Kendel Room. There were 10 of us and there was a lot of concentration. We are extremely grateful for our model, and would welcome volunteers to sit for us for two hours (we are a very friendly bunch!) give me a ring if you feel you could be a model, on 01608 810911.